We have written a great deal about solar advocates in many states (Nevada, Arizona, Florida, etc.) fighting utility attempts to stop the spread of rooftop solar. But there’s also a battle underway between utilities and proponents of community solar. Michigan provides a good example of how this conflict is developing. Michigan solar advocates claim some utilities are using regulatory hurdles to block proper development of cooperative-owned solar. They maintain that community solar is, in effect, being held hostage by these utilities. The situation is complicated by state lawmakers and regulators who tend to favor the interests of utilities over private solar developers, and by the lack of a consistent state policy on utility community solar. “Utilities have taken the initiative to do their own community solar projects and existing laws and policies make it difficult for private developers or communities to develop their own community solar projects in Michigan,” said John Sarver, former president and a member of the Board of Directors of the Great Lakes Renewable Energy Association (GLREA). Sarver notes he is speaking for himself and that his views do not necessary reflect the views of the GLREA board. In general, investor-owned utilities have pushed business models for solar where they maintain monopoly control of solar; keep competition out of the market; prevent or limit ratepayers from owning the systems themselves; and develop community solar in regulated markets where they can rate base the construction of solar. Rate basing allows them to earn a 6-8 percent guaranteed rate of return from any expenditures made in the planning, construction and maintenance of the solar project. Examples of two Michigan utilities that are developing community solar projects are the investor-owned utility Consumers Energy and the municipal utility Lansing Board of Water and Light (BWL). 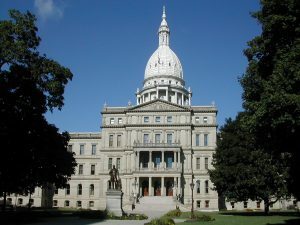 The differing business models of these two utilities, and the different missions behind them, provide some insight into why they chose different paths for their solar projects: Lansing is focused on providing the greatest benefit to the community, and Consumers is focused on providing the greatest benefit to shareholders. Even more ambitiously, BWL selected the Vermont-based developer groSolar to work on the largest single solar project in Michigan’s history: a 20 MW project. This will nearly double the state’s solar capacity. The words “economy of scale” here are significant. Varun Rai, one of the authors of a study on community solar and utilities by the University of Texas, Austin, claims in this article that utilities intend to appeal to ratepayers with their community solar programs through just such economies of scale, as a substitute for virtual net metering. In other words, utilities are hoping that if they can build the solar installations themselves profitably, they can prevent ratepayers from owning the solar and thus lowering their electric bills with their homegrown production through net metering. Consumers Energy opened its first two solar power plants at Grand Valley State and Western Michigan universities last year. Critics of the utilities do not consider themselves “anti-utility.” According to this article, they are rooting for Consumers Energy to succeed in its proposal to build its 10MW community solar program in Michigan. What they object to is that the utility’s “value of solar” methodology to compute the price of the solar power they would purchase from customers is inherently flawed. The Environmental Law & Policy Center filed a brief with the Michigan Public Service Commission, which said, “While it is a good thing that Consumers Energy is exploring community solar, the company’s initial proposal has serious flaws. The company’s bill credit formula undervalues distributed solar and its pricing terms lack transparency and accountability.” In other words, Consumers seems to be tilting the regulatory scale strongly in favor of solar owned by the utility – and this is not an isolated pattern. “Consumers Energy is being very conservative in defining what should be included in a ‘value of solar’ tariff,” Sarver said. “For example, their definition does not include the environmental benefits of solar.” This matters, because “value of solar” is one of the key measures used to determine if net metering rules are fair to solar homeowners and other ratepayers within the system. An unbalanced value-of-solar analysis will result in policies that disincent rooftop and net-metered solar. “Communities should explore behind-the-meter approaches to community solar, but it is difficult because of existing Michigan laws and policies,” Sarver said. In other words, like so many challenges relating to solar power, it is not a matter of confronting technological problems, but of a lack of political will.